I'm aware that finding all the news when it is scattered through many posts is difficult, and leads to mutliple duplication of comments, or comments where the answer is already shown on a different post. So I've simplified things this week by putting all the news back in the original posts. 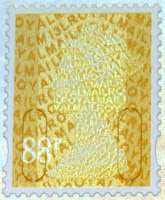 Details of the Football Heroes isssue, including pictures of the definitives from the Prestige Stamp book - which we now know has self-adhesive footballers in - are here. 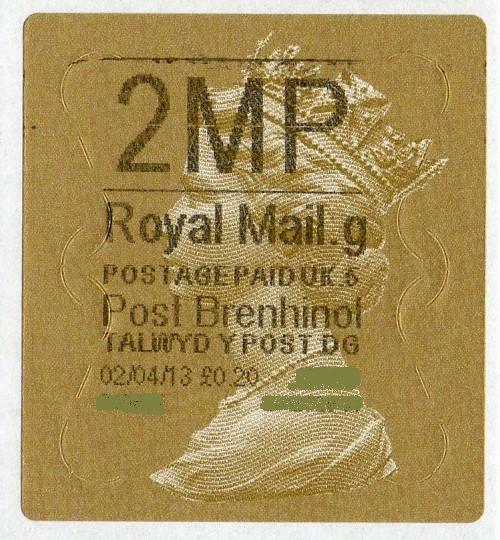 The picture of the 1st class stamp in the "Queen's Portaits" set has now been released and can be seen here. 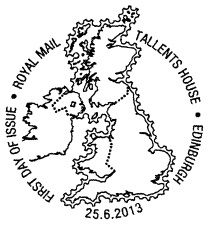 We have images of the Perth Congress Faststamps and will add these when there is time. 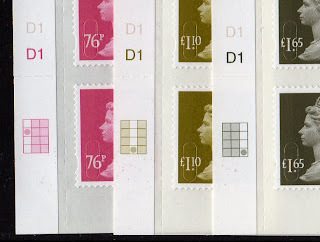 There are also some more new Machin definitives but we don't have all details or images yet. 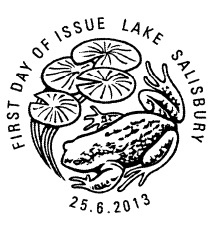 To whet your appetites here is the first of the new high value printings - remember these haven't been printed since 2009 when they were in cylinders of 6 panes, ie 3 guttered sheets of 50. 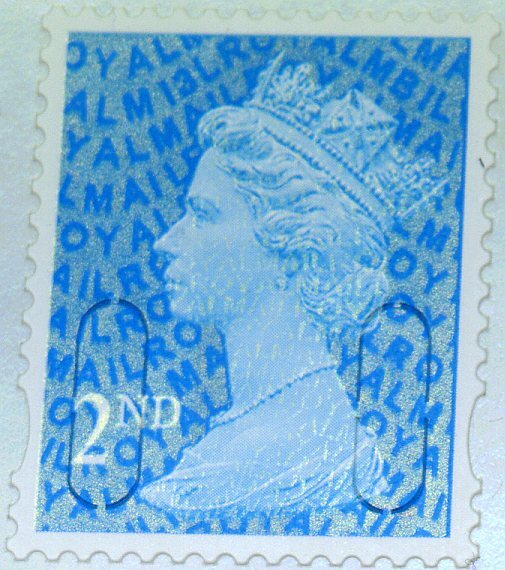 Now the £2 has been printed in a cylinder of 12* panes/sheets of 25 stamps. With De La Rue's MA13 code, and - we're told - with no date or sheet number in the margin. 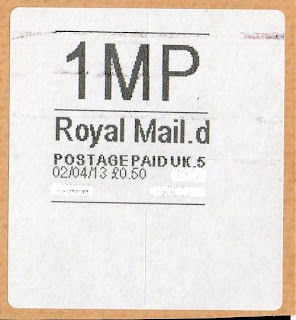 It seems that DLR still haven't got all their kit in order - or else Royal Mail have told them that this data is no longer necesssary. 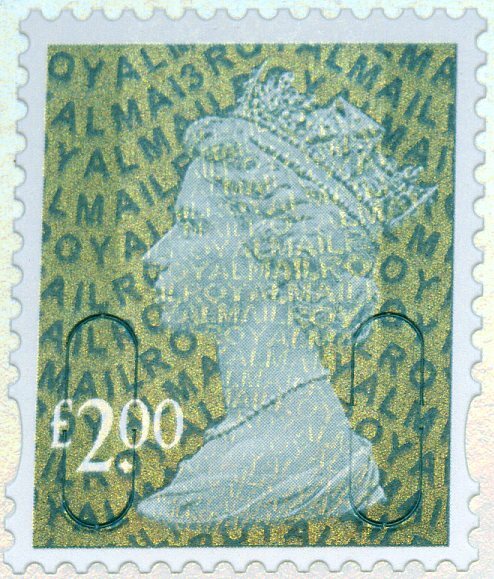 We've been told that this stamp is now included in the High Value Definitive presentation pack The writer has withdrawn the statement. 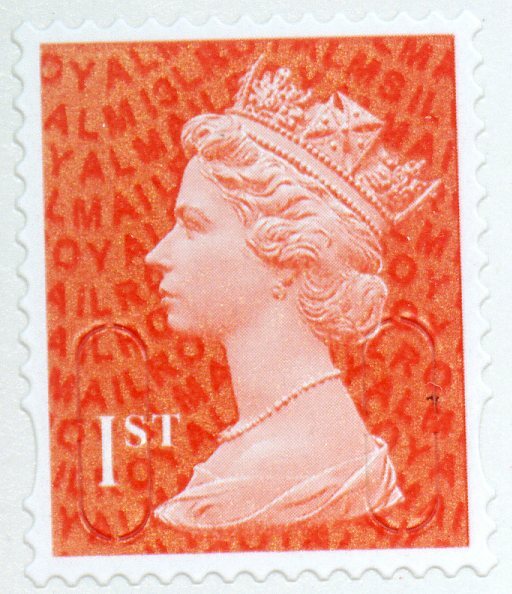 Following the issue of the Royal Mail red series of stamps on 3 January (with 2012 year codes) we reported the sale of the 1st class booklet of 6, and the 2nd class booklet of 12 with M13L codes. 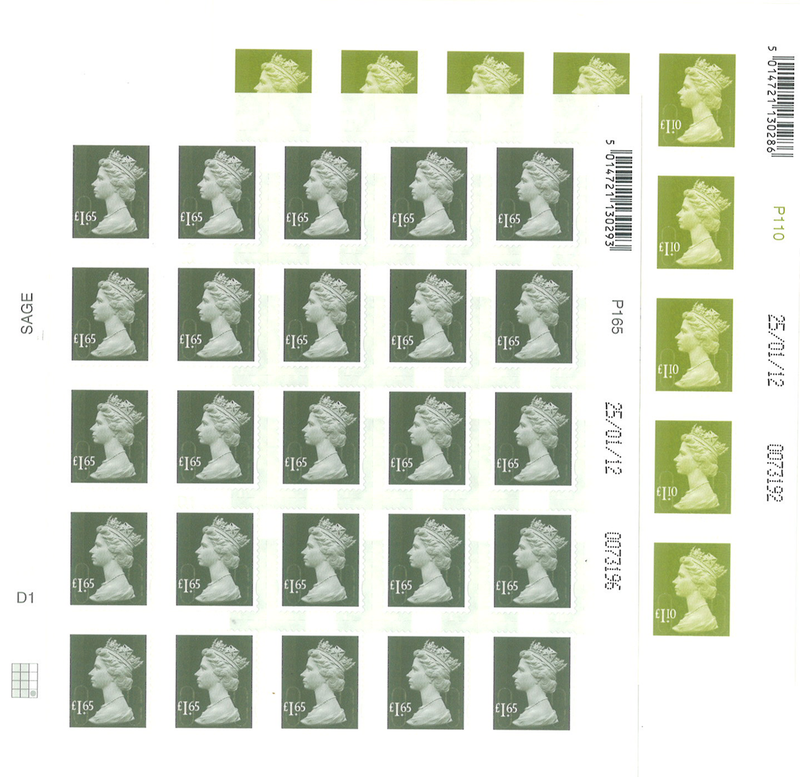 As reported last week, the new tariff stamps have MA13 codes, except for the Walsall printing of the specific valued stamps which have M13L. Apparently all should have had M13L but for some reason De La Rue used cylinders with MA13 on. 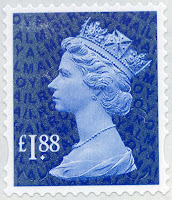 UPDATE: De La Rue's printing of the £1.88 has now been found, still with no sheet number or date. Doctor Who gets more complex: Tardis has two perforations! 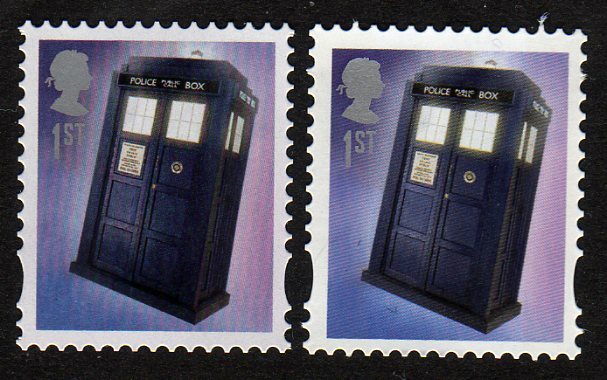 In an earlier report we calculated that there were 30 different stamps in the Doctor Who issue, although there is still some confusion about who printed what. 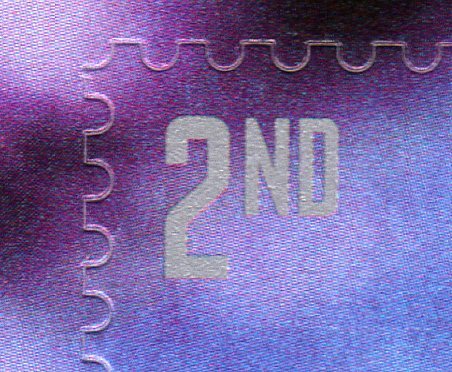 But amongst all the confusion we dealers and collectors often forget philatelic basics - and we have to acknowledge that we were not the ones to discover that the Tardis stamps exist with two different perforations! 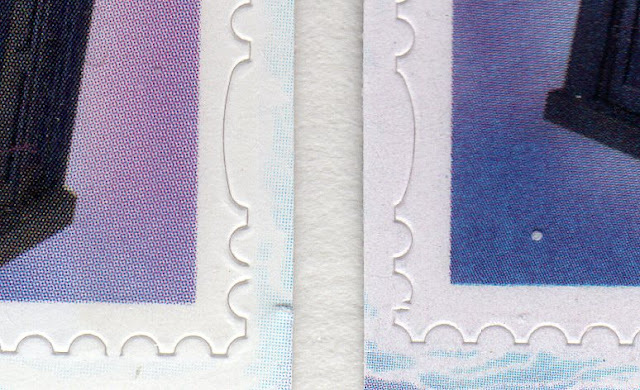 The difference is easy to spot without even resorting to a perforation gauge because the miniature sheet stamp has 11 holes above the elliptical one, and the pane stamp has 12. The stamps in the Retail Booklet & Generic Smilers Sheet also have 11 holes. 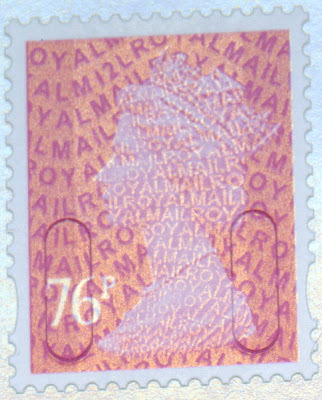 Royal Mail have usually made it easy for the self-adhesive sheets and panes to be removed from the backing paper for fixing to FDCs (or even postal packets) by ensuring that the die-cut perforations are interrupted. 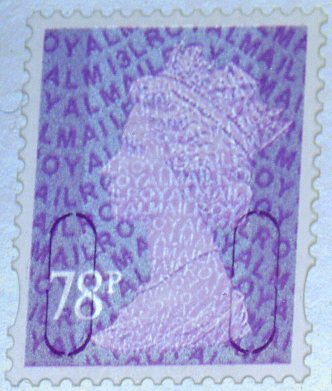 And this factor also demonstrates that perforators were used. 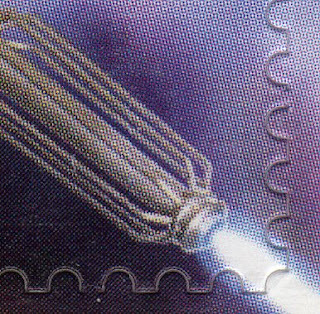 On the Miniature sheet the Tardis stamp perfs are interrupted on the end of the 3rd tooth in from the corners, on each side, except that the interruption is on the 2nd tooth from the bottom on each vertical side (8 in total). On the PSB pane there are just four interruptions: top left and top right are on the lower side of the first tooth, lower left is on the upper side of the last tooth, and lower right is on the lower side of the last tooth. 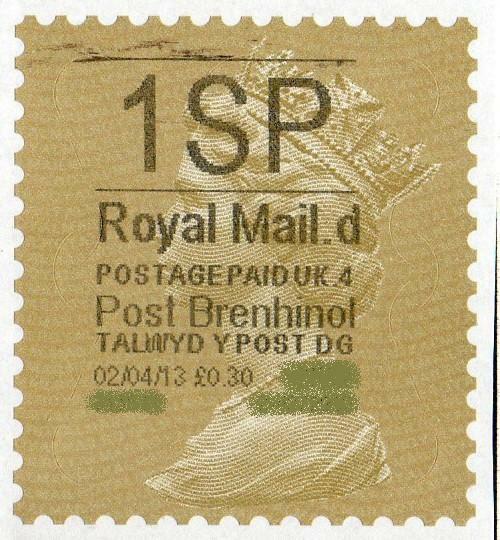 There are no interruptions on the short side of the stamp. 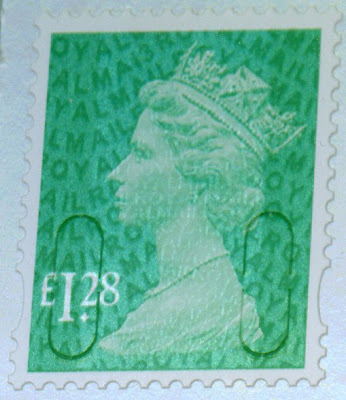 Thus 3 are within the sides, and the lower right is right on the corner. 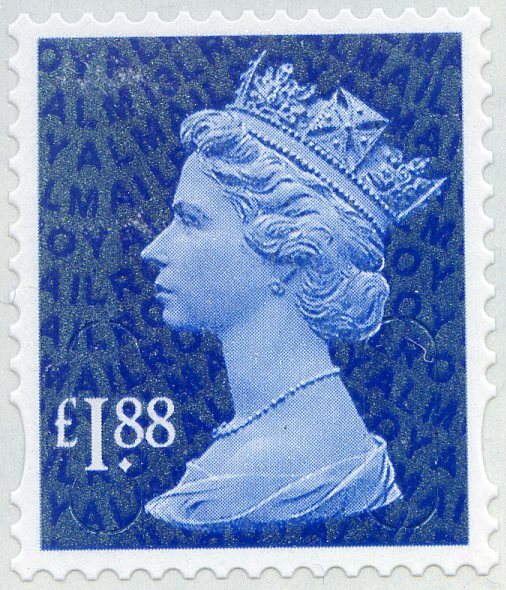 This can be seen in the images as an uneven tear of the paper, rather than a clean die-cut, most noticeable on the top of the right-hand stamp in the image. 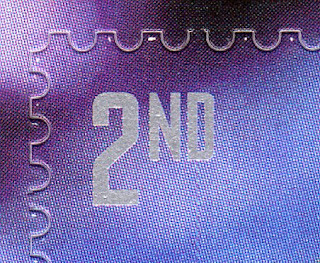 Similar differences occur on the 2nd class stamps. 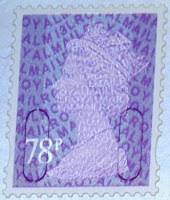 The MS has interruptions on the top of the 4th tooth on each side (hence 8 in total). 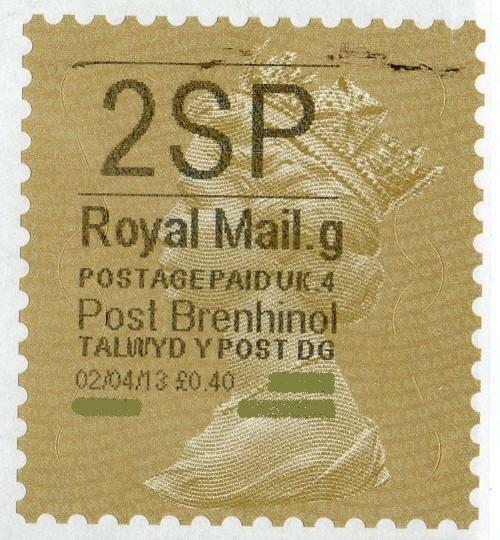 The stamps on the PSB pane have just 4 interruptions, in various positions and various sizes, on the last tooth on each vertical side (as with the Tardis). 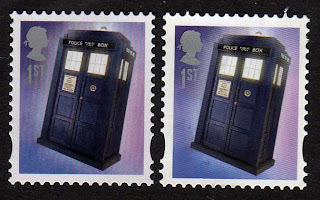 Incidentally the size of the Tardis stamp image is different on the Retail Booklet. The stamp design on the Retail Booklet is 17.5 x 21.5 mm but on the stamps on the Generic Sheet, Miniature Sheet, and MS pane from the PSB have images only 17 x 21 mm. Letters are now confined to ordinary and Large Letters (1L, 1LL, 2LL) and the 1PK. 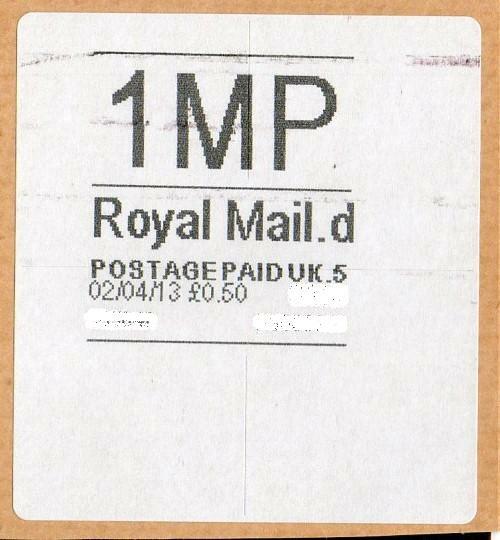 2PK, and SP codes have been replaced by 1SP, 2SP, 1MP, and 2MP codes for small and medium parcels. As the size-based-prices system also applies to British Forces mail corresponding indicators of BSP and BMP were also introduced. Here are examples of some of the new indicators, including examples on white labels so that they can be seen more easily. As usual the changes exist in both English and bi-lingual versions. 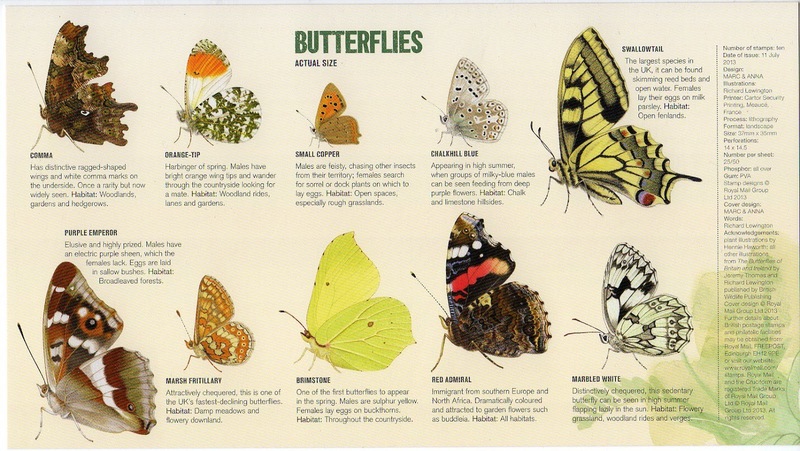 More on this website, where they are also for sale. 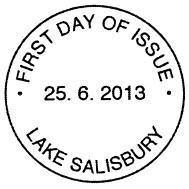 Further printings took place through the year including 10/01/12 all with the M11L year code. 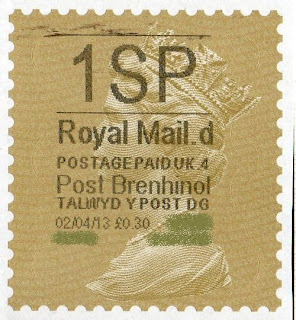 Later in the year, it became obvious that Royal Mail would not be able to change postage rates again at the end of March 2012, and that the announcement of new rates and implementation of the change would be delayed. A further printing of the much used 76p (airmail letters outside Europe 10g and worldwide postcards) was necessary. 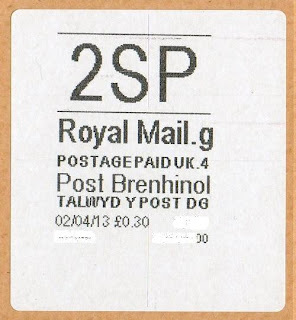 This printing took place on 25/01/12 but despite the fact that the grid showed this to be a 3-value printing (as above), the £1.10 and £1.65 values were apparently not placed on sale at post office branches, and they were never on the date/cylinder list provided to dealers by Royal Mail Tallents House. 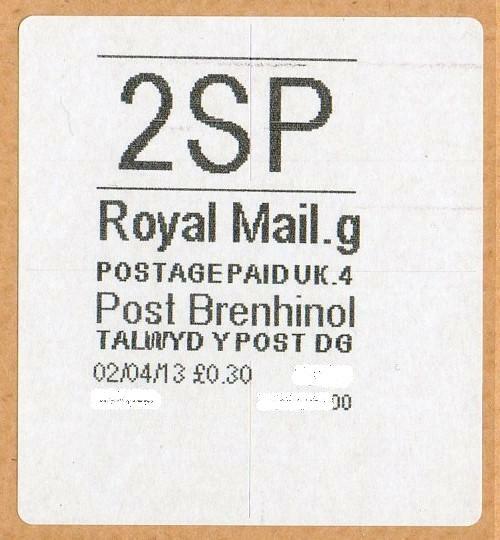 However we have now been sent a scan of the two values from that printing. 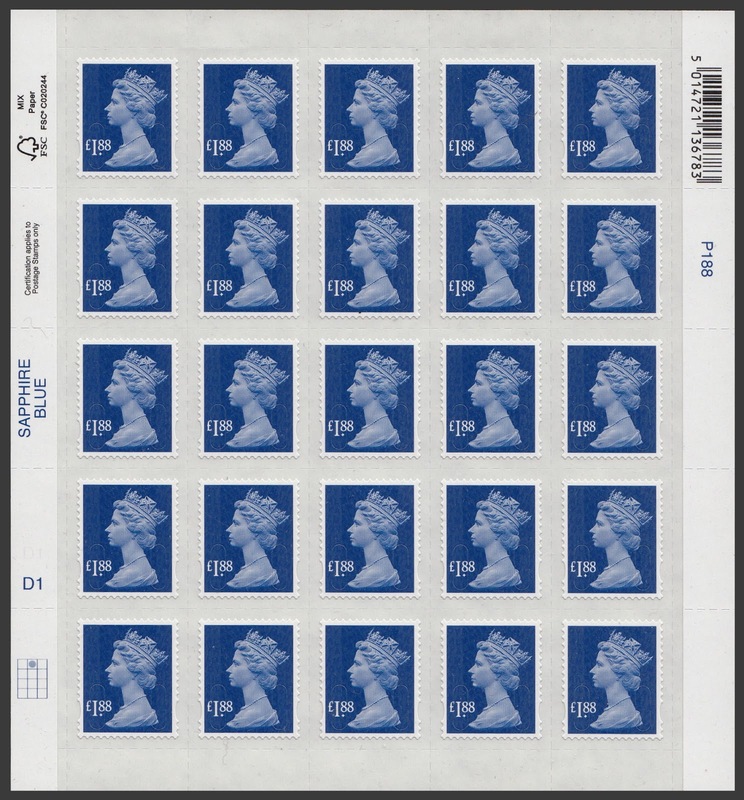 Sheets from this printing are not, as far as we know, in the hands of any collectors or dealers**, although it has been suggested that they may have been obtainable from Royal Mail's online shop. However, as the values ceased to be available there with effect from the introduction of the new tariff when they were replaced by the £1.28 and £1.90 values, I find this hard to believe. 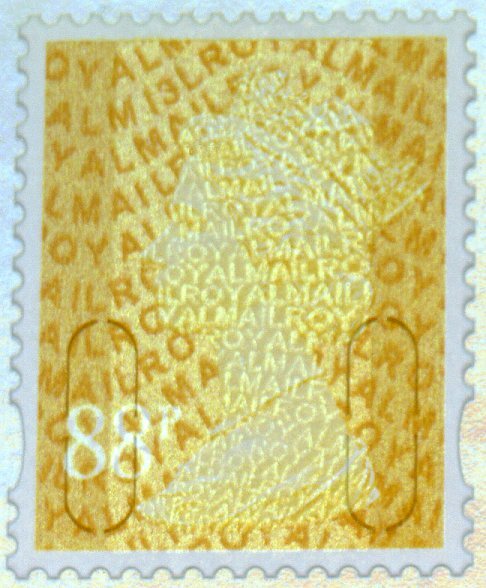 These sheet numbers (007319-) are higher than the ones we have in stock for the 76p (0039977) so a considerable number of sheets were printed. 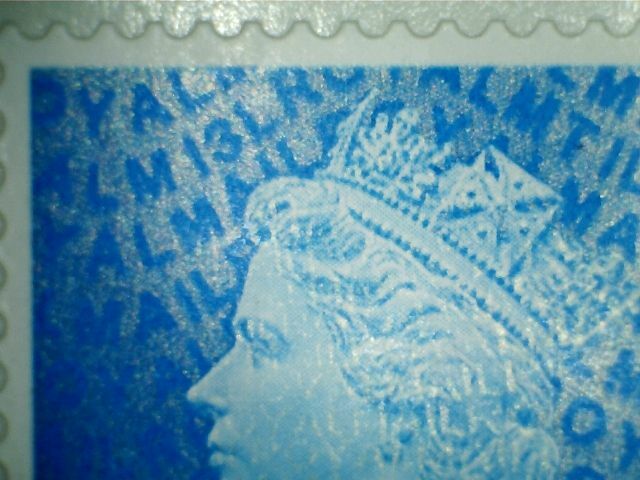 But if these stamps from this printing were made available to anybody, then they should have been made available to everybody. 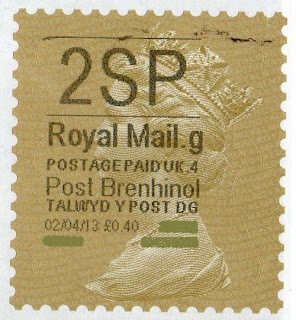 If they were sold from Royal Mail Direct (in Edinburgh) then they should have been available from the Philatelic Service (in Edinburgh). After all, the Philatelic Service stands to profit from sale of stamps which won't be used, so it makes much more sense for Royal Mail to sell them to collectors. The gap between the left hand and the right hand seems to be one into which any number of stamp printings could fall. 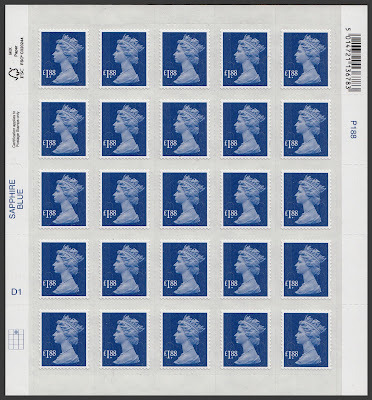 If anybody does hear of the £1.10 and £1.65 M12L stamps existing with collectors or dealers we would be delighted to know more, and we would protect our sources as always. Do let us know. **And note: we do not have any of these; and to the people who read about them here and then go to Richard P in Norwich as their usual supplier, he doesn't have any either! 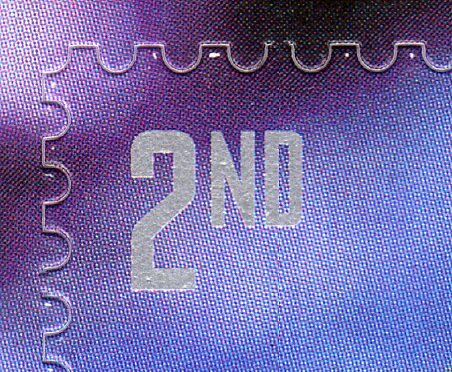 Following the comment regarding scans of the iridescent code on the above, I'm adding the 76p image which we know came from the same date's printing. 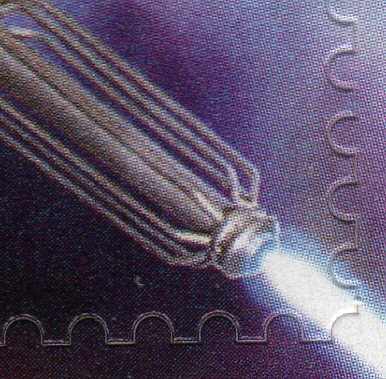 The iridescent cylinder is one cylinder across all three columns so they must all be M12L.